GARDASIL - a new cervical-cancer vaccine heavily marketed to young girls in ubiquitous ads on TV and in movie theaters - is under investigation for possible links to paralysis, seizures, and 18 deaths. Federal health officials have logged 8,000 "adverse events" in girls and women injected with the Merck & Co. vaccine introduced two years ago, more than 500 of them from New York. And lawyers last month filed the first two claims on behalf of girls with ailments blamed on Gardasil under a federal program to compensate victims of vaccine-caused illness, The Post has learned. Both girls got the injections at their middle schools. One is Jesalee Parsons, now 15, of Oklahoma, who began vomiting the day she got a Gardasil shot and developed pancreatitis, her claim says. "It makes me mad because they're saying how great it is, but they never mention how many people have been hurt by it," Jesalee told The Post. Healthy all her life, her family says, Jesalee has been hospitalized on and off for more than a year. She restricts her diet, takes pain pills and misses many school days. "I'm pretty sick all the time," she said. 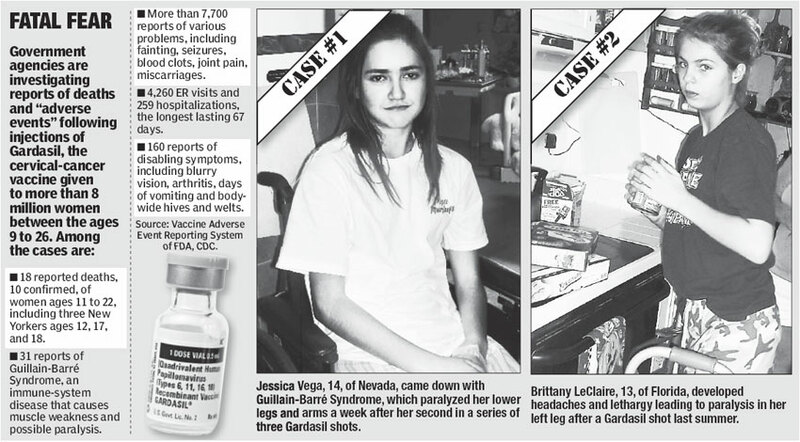 The other claim was filed for Jessica Vega of Nevada, who came down with Guillain-Barré Syndrome, an immune-system disorder, at age 14 - a week after her second Gardasil shot. Thirty others have reported the syndrome after getting the vaccine. JESSICA'S mom, Rhonda Vega, says the girl's lower legs and arms were paralyzed, but she's learned to walk again. "Protecting girls against cervical cancer is a fabulous thing, but if this is what's going to happen, they need to research it more," she said. In Florida, the mother of 13-year-old Brittany LeClaire said her daughter suffered headaches and lethargy after a Gardasil shot last Aug. 13. On Sept. 2, Brittany's left leg became paralyzed. After months on a walker, she limps. Her pediatrician "highly recommended" the vaccination, mom Christina Bell said. "He told me it was a cancer preventative. I thought it was the right thing to do. You see it advertised on TV every 15 minutes." Brittany's case is one of six being prepared for filing by Boston vaccine lawyer Kevin Conway. He said other cases include "paralysis, seizures and brain damage." Gardasil was licensed by the Food and Drug Administration in June 2006 for females ages 9 to 26. Sold worldwide, it's been given to more than 8 million US girls and women, Merck says. The vaccine is aimed at warding off strains of the human papillomavirus, or HPV, which can lead to cancer. The vaccinations cost a total $360. Securities and Exchange Commission documents show Merck made $1.5 billion in Gardasil sales last year. ONE doctor who helped conduct clinical trials on Gardasil told The Post the vaccine has been aggressively marketed to girls too young to need it. "There's a huge push for giving this to girls 11 and 12 years of age," said Dr. Diane Harper of Dartmouth Medical School. "There's no hurry. You can give it to someone who is 20, 25 or 30 and still have the same level of protection." The Vaccine Adverse Event Reporting System, run by the FDA and the Centers for Disease Control and Prevention, has collected thousands of reports of health problems after Gardasil shots. * A 17-year-old New York girl who collapsed and died on Feb. 22 this year, two days after the last of three Gardasil injections. An autopsy could not pinpoint the cause, but doctors suspect a heart-rhythm disorder. * An 11-year-old who suffered a heart attack in May 2007, three days after a Gardasil shot. The nurse who reported it said a doctor blamed it on "an anaphylactic [severe allergic] reaction to Gardasil." The feds could not confirm the case. * A 12-year-old girl with no prior medical problems who died in her sleep on Oct. 6, 2007, three weeks after a Gardasil shot. DR. John Iskander, the CDC's acting director for immunization safety, said a review of 10 confirmed deaths found no common thread. Officials "concluded to the degree of certainty possible" that Gardasil wasn't to blame. "It's tragic that young, apparently healthy people, do die," Iskander said. But he added that doctors hold special meetings weekly to review new cases, and compare them to prior ones. Fainting is the main symptom linked to Gardasil, he said. Merck spokeswoman Kelley Dougherty said the company "actively monitors" reports of side effects. "An event report does not mean that a causal relationship between an event and vaccination has been established - just that the event occurred after vaccination," she said. A Post analysis of adverse- event reports filed through April 30 found that about 20 percent followed injections of Gardasil, plus up to seven other vaccines at the same time - including shots to prevent flu, chicken pox, hepatitis and tetanus. Almost 6,300 cases involved Gardasil alone. Under a federal law passed in the late 1980s, victims of vaccines may file a claim under the Vaccine Injury Compensation Program, but cannot sue the pharmaceutical. Last year, the government added HPV to a list of vaccines, including polio, hepatitis and measles, granted immunity from suit. If victims prove a vaccine likely caused injuries, the program pays a maximum $250,000 for death. The average payment for injury has been $1 million.